This was a fairly rare opportunity for some face to face wargaming for me. Some years back I used to host weekend gatherings of some reenactor friends for team wargames while my dearly beloved was away at Sci-fi conventions. We gamed, if I remember the sequence well, a 1944 airborne/land river crossing operation (possibly one of the cancelled run-ups to Market Garden), Gettysburg, Albuera, Napoleon’s invasion of Kent, the (in this case failed) crossing of the Meuse 1940 and Vimeiro 1808. Gradually the lads became less available as their families expanded and grew more needful of their company at weekends. One who has maintained the interest, but not the available time, now has a son at university who expressed an interest in playing a game after a four year break. As he was home for a while and I am now retired a mid-week game was possible, albeit with just the two of us. Fortuitously this coincided with the Memsahib taking her horse away for a week’s residential course, so we could claim occupation of the dining room. I had a week’s notice of the impending game, and I knew that as usual, whatever we did I would need to paint and re-base models and prepare terrain. I have spent years re-basing 6mm soldiers in various configurations until I hit on a standard of 2cm x 2cm x 1mm MDF for everything (of which more later). My opponent, BJ, likes tank battles. For simplicity – one of the criticisms of my games weekends is having to learn a new set of rules every time – I decided to use Richard Borg’s Memoir ’44 game system translated onto a “Kallistra Hexon” terrain with 1/300 models. 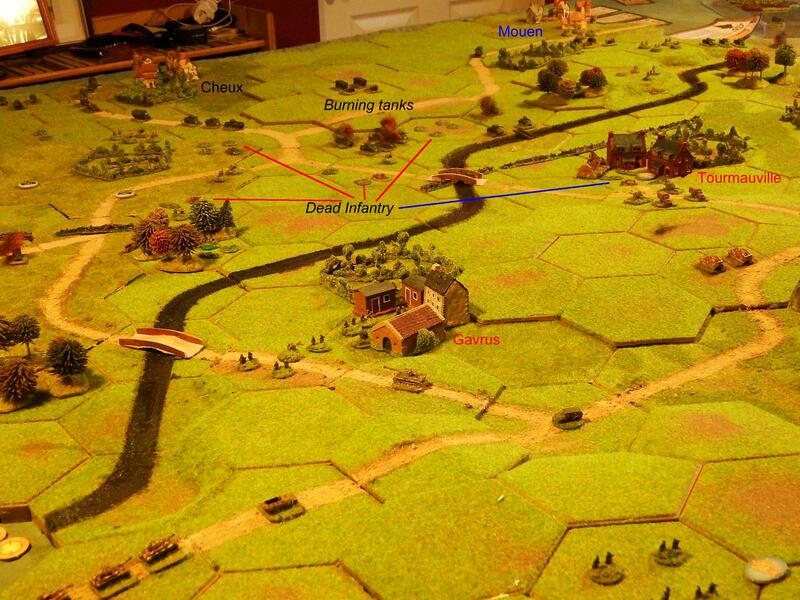 Searching the scenario books I found Operation Epsom which had a map of 13 x 17 hexagons, or approximately 5ft x 4ft. This was the one. I dug out the models and found – shock! horror! – I owned no Tiger tanks at all. Emergency order to Irregular Miniatures (one of the fastest suppliers I know) for a couple of Tigers – only one needed, but planning for the future – and some other specific models where I had usable alternatives within the game rules but I like to play with the correct tokens! The other modelling point was that many of my WW2 infantry had already been re-based onto circular plastic counters in ones, twos or threes in an experiment with Rapid Fire rules and instead of my early war 2cm x 2cm bases with four figures I had a load of 1cm diameter bases with two figures each. I compromised. Only I can tell the difference without examining the underside (when flocked) between a rifle unit on a green plastic counter, a machine gun unit on a yellow counter and a mortar unit on a red one. MG and mortar bases were re-based yet again onto 2cm x 1cm x 1mm MDF bases with three figures instead of two for rifle bases. The owner would need to check only if the associated weapon appeared to point upwards or forwards. I laid out the terrain. I had to create some new road and stream sections, simply by scraping off flock with a sharp knife and painting the road or stream. Roads are covered with fine sand while the paint is wet. I use MFI tester pot “pebble” as the preferred colour for my roads after observation of what roads look like from aircraft overflying Europe. Streams are painted blue, then soot, with PVA glue added when dry to give a “wet” effect. The River Odon is at the scale of the battlefield (1 hex = ca 1500m) no more than a stream and is designated as a “fordable river”. Next problem: not enough slope hexes for both Hill 112 and Hill 113. Emergency order to Kallistra who in this case beat Irregular to the delivery, but I blame the Post Office. The game table laid out for action with all the gaming aids. One of the advantages of using Memoir ’44 is that if you have the basic rule set, everything else you need for clarification is available online, including an FAQ section and a card database for all troop types, actions, terrain, etc. I printed as many of the relevant cards (by default at four times the original card size) as I thought I needed, and kept the I-pad handy pre-linked to both FAQ (downloaded PDF) and card database sites in case further clarification was needed. BJ is a computer geek so this was not seen as any problem when we needed to halt the game for five minutes to check a rule. This battle is a hard nut to crack for the British player. Checking the Days of Wonder website afterwards I found the results are 2:1 in favour of the Germans, who historically stopped Monty in his tracks at Hill 112 after a costly advance by the British. The British view south. Red captions are British objectives. Click to enlarge. The British commander has six designated objectives, each worth one “Victory Medal”. Victory Medals can also be gained by eliminating enemy units. The target for both sides was 11 medals to win the game. The German view north. 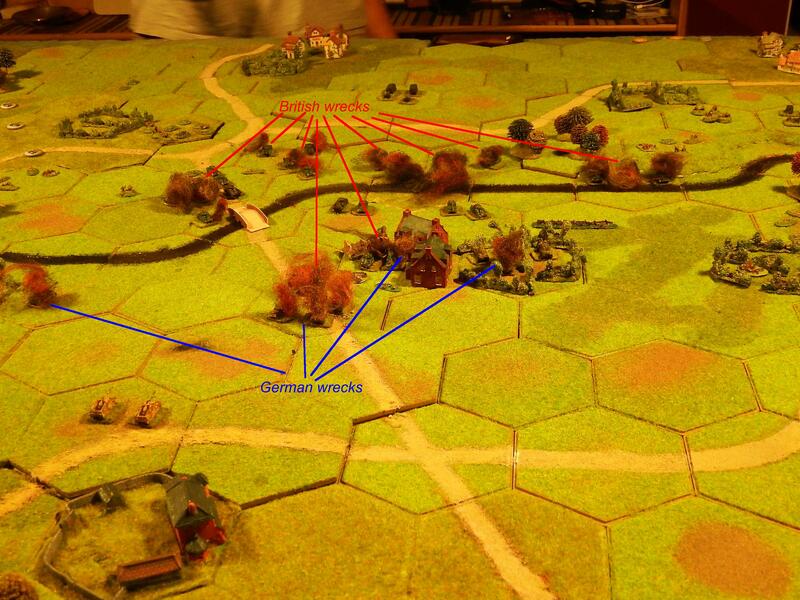 Mouen, captioned in blue, is the only German objective. Click to enlarge. The Germans would earn their 11 medals mainly by wiping out the British attackers. BJ chose the British side, which meant that my job was – as I perceived it – to sit tight and shoot everything that came into my lair. Would that it were so easy! For those unfamiliar with the game system, it is card-driven. Each side has – in this case – six command cards. One card may be played each turn allowing 1, 2, 3 or all units in one sector of the battlefield (left, centre, right) to be activated. Other cards specify options such as “issue an order to all infantry” and many of these cards confer bonus dice in combat. The dice are marked with symbols so that, for example, to hit a tank unit one must roll a tank symbol. Each unit type has its own characteristics, bonuses and limitations, which is why the card index is so useful. BJ started the battle with a general armoured attack in the centre followed by an attack on the right flank by infantry who skirted the German minefield by moving slowly through the woods. I met his armour with my highly effective 88mm AT gun unit in the centre which spent the evening failing to miss until finally overrun. As his tank units forded the Odon they had to halt just within range of all my artillery, so I picked them off one by one, bringing up my tank destroyers to help out. One noticeable failure was my Tiger tank unit which was supposed to be hard to destroy (every hit is re-rolled with a 1/6th chance of an effective strike), but which was knocked out by the first enemy shot! Michael Wittmann earned a wooden cross rather than an iron one. Try as he might, BJ failed to break through my defensive line, but it was a close run thing, ending with an 11:10 victory for the Germans. This was a record. Not only had we finished the battle in the allotted time but we had the whole of the next morning free. We decided to reset, swap sides and start again. After a hearty breakfast this time I took the British side, and we had both learned from our opponent’s failures of the previous evening, so we set to. As we were now on a time budget we dispensed with the niceties of casualty markers, ruins and “smoke’n’flames” (and therefore also with photographs). I began with an attack on the right flank by clearing a route through the minefield with my flail tanks and grabbing the first objective of Grainville for one victory medal. I followed up by using my bridging tank unit to make a third “free” crossing of the Odon NE of Tourmainville and sent tanks, including a unit of Churchill AVRES armed with petard mortars, across to take that village for a second medal. From then on things began to go downhill for me. BJ had the clever idea of placing his command unit (I did not have one) on a hexagon spanning both left and centre sectors, so that every card he played for either of these sectors would activate one extra unit. Why did I not think of that yesterday? He began to push me back on the right flank. This was not a major problem because the victory point for capturing a village is not lost if the village is retaken, unlike the two hill objectives. I pushed on in the centre. He moved his dreaded “88s” into Tourmainville for better defensive protection against infantry and tank attacks, but not against my heavy artillery, which picked them off. I then concentrated on the left flank with the aid of an RAF Typhoon squadron which proved to be very helpful. But I learned that with this game system it is rare that you can be effective in one sector without taking your eye off the ball in another. BJ advanced on his left, my right, to great effect, particularly with the Tiger tank unit that had been so easily destroyed the previous evening. Every attempt I made on this unit merely forced it to retreat out of range of the supporting troops I was trying to concentrate on destroying it! Towards the end of the game, with the scores standing at 9:9 and then 10:10, both of us abandoned all pretence of a historical game and focused on destroying the easiest target to get that final, elusive point to win. It took four turns before BJ spotted what I had already seen: an artillery strike on my unprotected supply truck would clinch the game. So game two also ended with an 11:10 result for Germany. We agreed that it had been fun. The game system is easy to grasp, well supported by the creators and largely accurate, but is in the end a game, not a historical representation. I am using the Memoir ’44 system for my refight of World War Two in its entirety as covered elsewhere in these pages and I will be looking eagerly, but carefully, at more of the expansions, particularly the D-Day Landing kit. I’ve had many a fun game of Memoir ’44, but, you’re right, it’s not a simulation, by any stretch of the imagination. None of my games of Memoir were this pretty, though! Great looking game.